Join us alongside the ultra-luxurious AVE for another fantastic event! 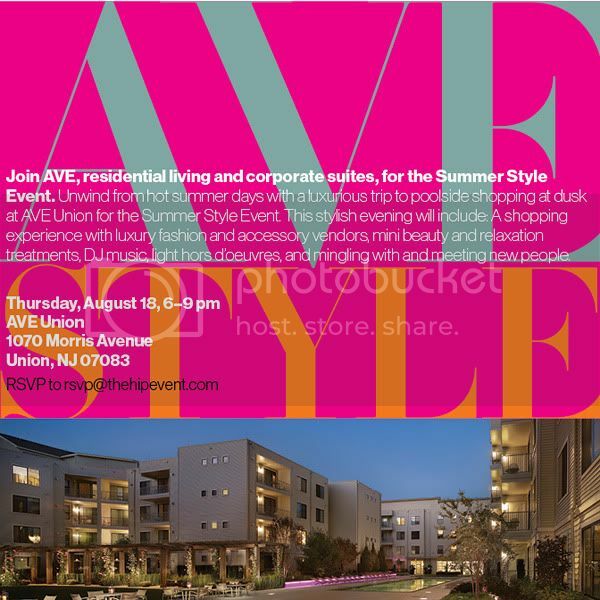 Hosted at AVE Union in Union, NJ, take a cool break by the poolside. From 6 – 9pm on August 18th, experience unique poolside shopping from luxury fashion and accessory vendors, as well as mini beauty and relaxation treatments. The Summer Style Event will also be host to some celebrity guests such as Gayle Giacomo, owner of the Gatsby Salon and star of Style Network’s Jerseylicious, and Jennifer and Jay Jacobs of NBC’s Biggest Loser Season 11, who will be giving workout tips in AVE’s gym. Click the image for more info on Facebook. During the event, guests will be pampered with mini-beauty and spa treatments from Laboratory Hair Studio of Morristown, Sensaria Natural Body Care of Cedar Knolls, Butter by Keba of Brooklyn, and professional makeup artist Sonia G. Active Center for Health & Wellness of Hackensack will also be on hand to offer guests mini-massages, acupuncture treatments, physical fitness evaluations and Bio-Hormone Replacement Therapy consultations. Guests will also enjoy cocktails by VeeV Açaí Spirit, delicious summer fare from the Real Housewives of New Jersey’s The Brownstone, tasty treats from ALM Dessert Bar, and music by DJ Paul Anthony.